When does a space become a home? Is ‘home’ only objects, curated compositions and cosmetic overlays? Or does it have something to do with comfort, and the fact that you can put up your feet without having to think about that expensive upholstery, or that kids can play without the fear of toppling something expensive over? 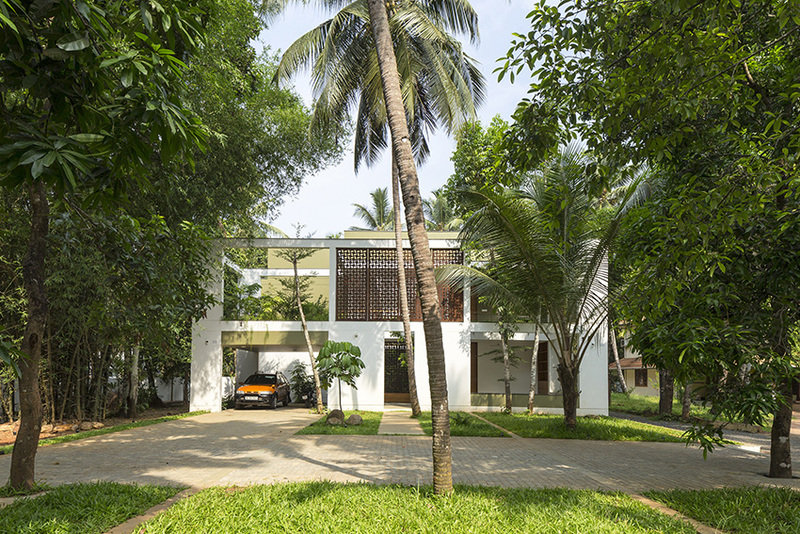 All these issues and more come into discussion when architects Lijo Jos and Reny Lijo take us through their recently completed — and already award-winning — project, The Regimented House. “We reject the popular notions of luxury,” they declare. 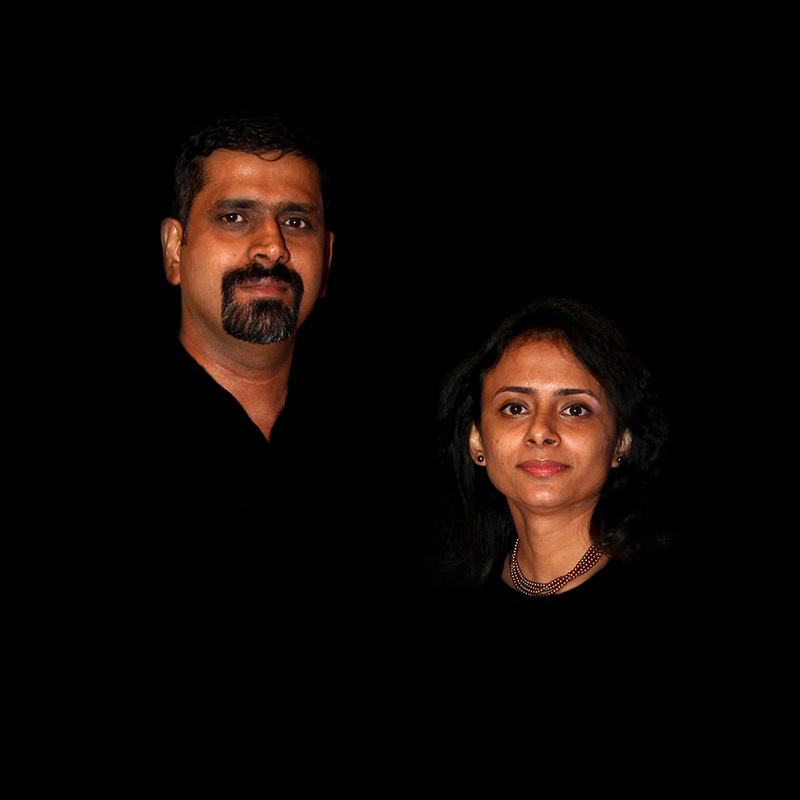 “We don’t believe in curated interiors, filled with look-at-me products. To us, the quality of space matters more.” The Regimented House is one such result of this preoccupation. The landscape follows the grid-like orchestration of the house — a subtle marker that establishes the surroundings as private property. 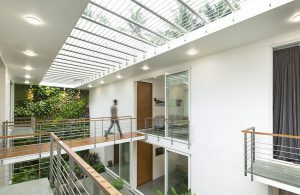 At the outset, the project seemed like an architect’s dream: a one-acre plot, lush with vegetation, in Mallapuram, Kerala. But closer study revealed complexities that made the project more challenging — and enjoyable. 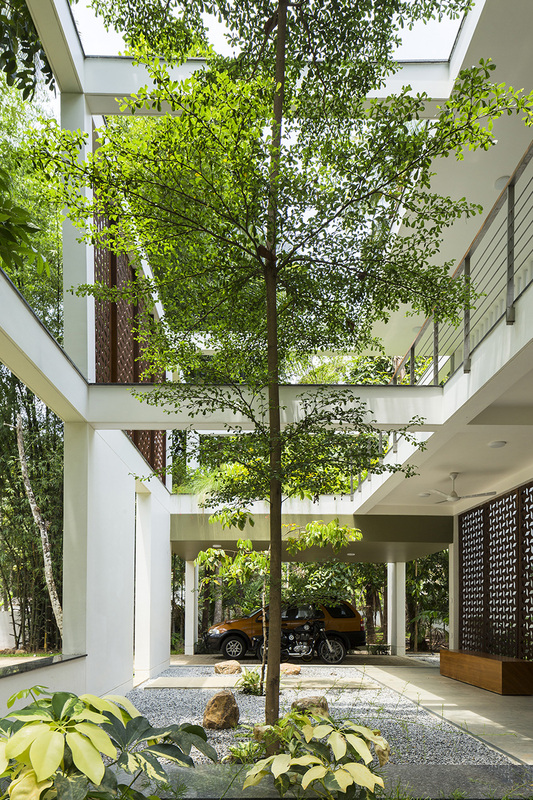 “The seemingly large plot populated with a variety of trees — small and large — was to be shared between the client and his brother, who had an existing house on site, without any compound wall in between,” explains Lijo. “However, an informal pedestrian path, allowing the plot at the back an access to the main road, literally cut the site into two.” Moreover, part of the plot extending to the south, marked aside for the future commercial activity, further reduced the buildable site to a linear strip. Given the presence of the thoroughfare used by people residing deeper into the locality who had no access to the road but this, put requirements of privacy and security right on top of the client’s wish. 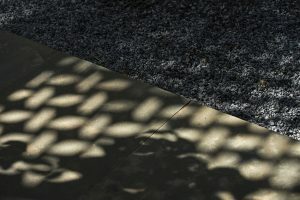 However, they also need openness and visual links to the landscape, celebrating their connections to the land. “The clients, like many, worried about security and privacy, wanted a strong sense of ownership and exclusivity even without building any walls separating neither the pedestrian path nor his brother’s house. 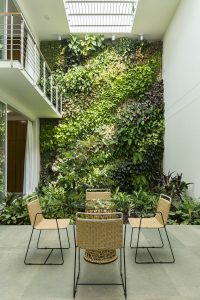 Adding to the complexity was their deep desire for an inside-outside feel for their house, with the inclusion of nature as much as possible,” discloses Reny. 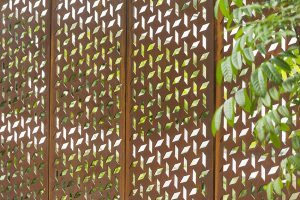 Perforated Corten steel screens ensure visual porosity while being mindful of security. While developing the architectural language of the house, the architects turned to American artist and ‘miminalist sculptor’ Fred Sandback, who worked with acrylic yarn and elastic cord to delineate space with minimal means. “His work was quite intangible but precise,” reveal the duo, “and sculptures were made to securing yarn and cord to walls and floors to create geometric forms.” Like Sandback, the architects explored methods of establishing a spatial programme by using a strategy based on notional boundaries rather than traditional methods of delineating space. The result was ‘The Regimented House’. Simple yet formal in nature, it has been articulated as a grid-based layout with three parallel bays deployed perpendicularly between front and backyards. While one bay houses the public zone, the other functions as the bedroom block. 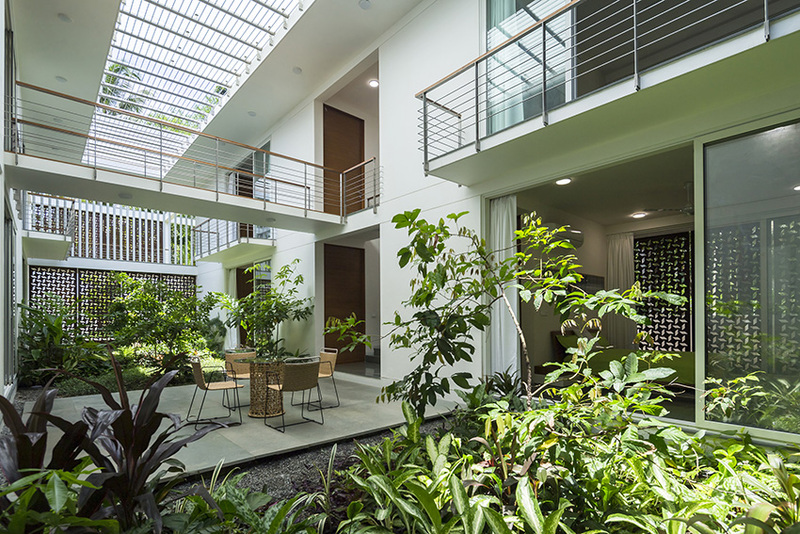 In the centre, a large double-height landscaped courtyard acts as a buffer between them. The extended frontyard and backyard which are demarcated by hard landscape grids established a notion of a boundary. This grid layout spills out into the landscape as well, signalling ownership and the private nature of the property, subtly yet effectively. The courts to the front and rear by hardscape grids that establish boundaries without seeming to do so. These also serve as mediators between the landscape and the built-mass, blurring the lines between the natural and manmade. With the architectural language being regulated and rigid, an entry court was added as a mediator to negotiate the transition between the verdant landscape and the structure. 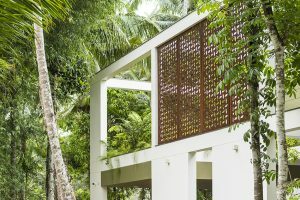 “The grid layout was designed… to ensure the essential blending in with nature as well as to soften the otherwise bold presence of the built-mass,” elucidates Lijo. The ground floor of the primary bay houses the formal and semiformal functions of the house and the secondary bay has the two bedrooms, on each floor accessed by a staircase. An open dining and a bridge placed in the central court informally connect the two. The layout of the house is designed in such a manner that each room in the house enjoy perfect cross ventilation, making the best of seasonal shifts of winds, keeping the internal temperature at a possible low throughout the year. The central court acts as a continuation of the larger landscape, rendering a feel of living amidst nature. Large openings facilitate this feeling. 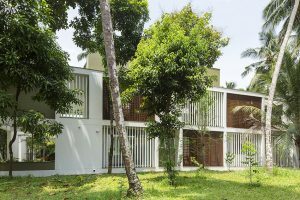 Given the open, verdant location, the temptation to create large openings was natural, say the principals at Lijo.Reny.architects, but these were pragmatically screened with perforated Corten steel and GI pipes to facilitate both privacy and ventilation. “When lit up at night, the house looks like a lantern glowing in the woods,” smile the architects. Internally, openness and proximity to nature are achieved by means of large sliding doors that ensure an open layout when desired. 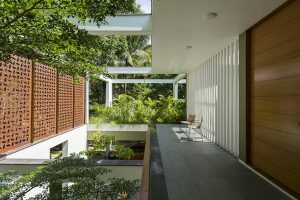 “This possibility of engaging with a fairly large internal landscape, with trees that may grow to touch the ceiling, gives one the feeling of being outdoors with the elements, enjoying each season, each moment.” The internal courtyard also belies the seemingly compact nature of the house, surprising the visitor with the strong, continuous element of greenery in a home sited in an already lush environment. Materially and decor-wise, The Regimented House speaks a minimal language. A comfortable palette of natural stone and timber veneers allows an appreciation of the volumetric experience, without any distracting elements coming into play. 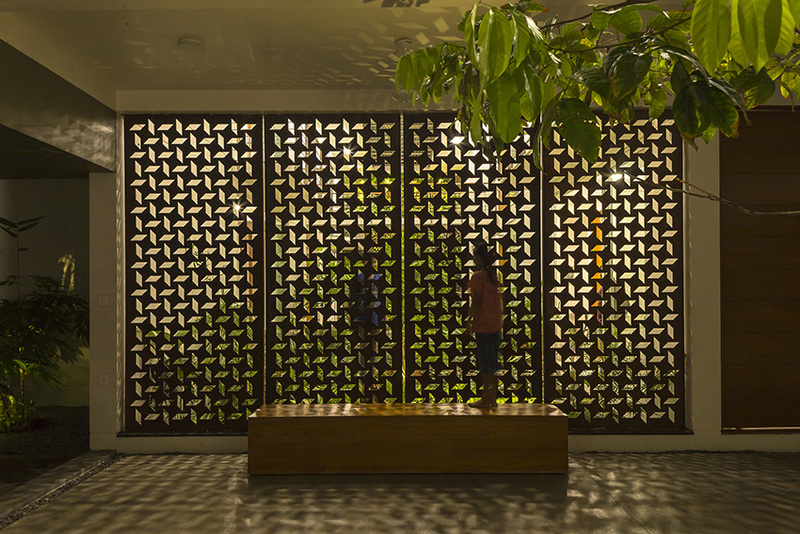 Corten steel was specially chosen for its chromatic similarities with terracotta, which, along with the greens of the vegetation, is a familiar, friendly combination in Kerala’s traditional architecture. “While it may start with as a dark grey, this variety of steel weathers to an orangish shade, much like terracotta — as a matter of fact terracotta weathers the other way round, it starts with an orangish shade and becomes dark grey later. The simple reason for using Corten steel is for its properties as a secure, hardy external material; and at the same time it brings in the familiar colour of terracotta into the project… which is why we opted for it,” explains Reny. The client-bought furniture toes the architects’ diktat for subtlety and simplicity. The one thing the architects are especially proud of, are the several pieces of customized photo-art, featuring a duo of contrasting abstracts and a mirror — which together create a surreal experience. “Often, simple designs create warm, everlasting memories,” say the architects. 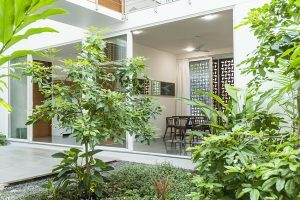 “The kids see the house as a large playground enabling them with exciting new experiences each day, and the owners have already slipped into these secure yet comfortable spaces, enjoying the simple pleasures of life.” And that, is how a home should be. 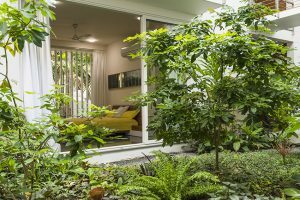 To create a balanced, timeless living space that would be open to nature, yet secure; one that weave greenery as an integral part of its experience. The shell of the house, with insets of GI pipes and Corten steel. The grid-like openings in the shell are left bare or fitted with screens, depending on the privacy requirement of the programme within. 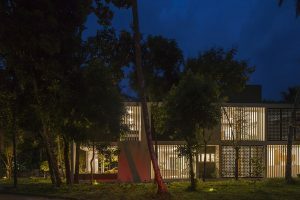 The screened elevation with insets of GI pipes and Corten steel allows light to filter through, making the house seem like a lantern glowing in the dark. The material palette is earthy, familiar and comfortable. 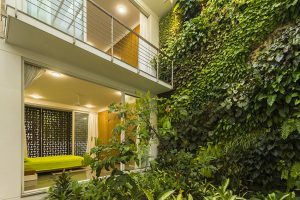 The dense green surroundings are bisected by a pedestrian path, one of the challenges while designing this house. Besides its strength as a secure hardy external material, Corten steel was also chosen for its colour characteristic. The original metallic grey oxidizes to a deep rust that brings to mind terracotta, a popular building material in Kerala. 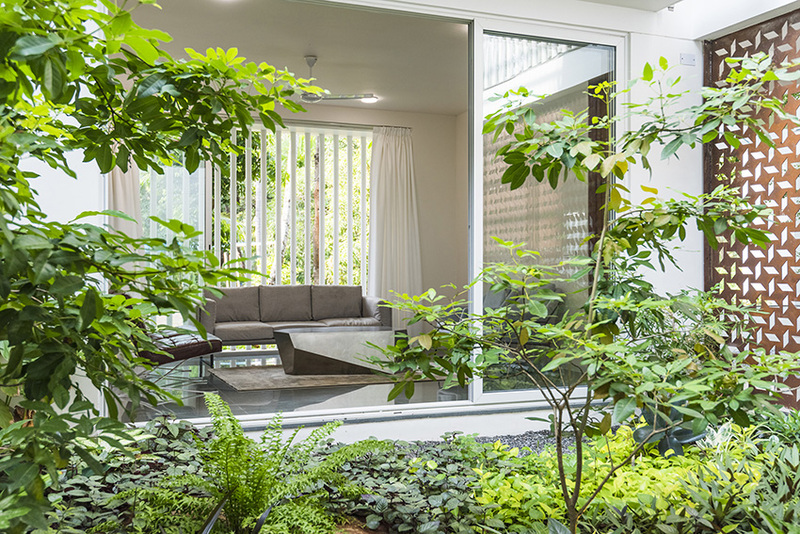 Living areas are deployed around the central courtyard, making nature an inextricable part of the spatial experience. 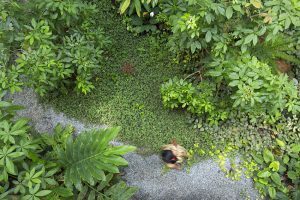 Sightlines extend from one corner of the house to the other, and spill beyond, into the verdant surroundings. The programme is articulated as three linear and parallel bays — the public zone, courtyard and private zone — sandwiched perpendicularly between the front and backyards. The public and private zones are spanned by a bridge on the upper level. The breakfast space, cocooned in green and bathed in sunlight. The layout of the house is designed in such a manner that each room in the house enjoys perfect cross ventilation, making the best of seasonal shifts of winds, keeping the internal temperature at a possible low throughout the year.